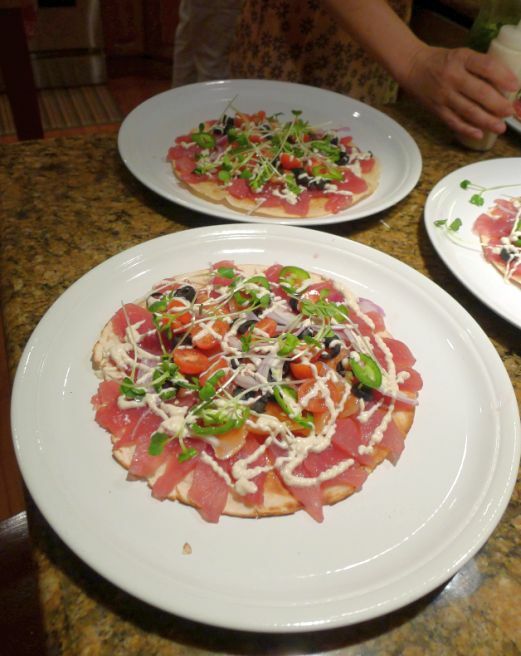 The next time you are making pizzas take a different route and try something different as the Tuna/salmon gravalax pizza served with anchovy aioli! You will be so surprise as how good this pizza comes out! 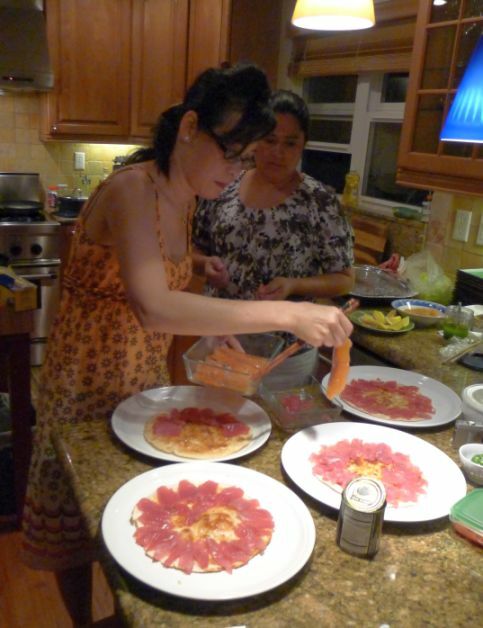 First you heat up the flour tortilla in a lightly oiled pan, then you smeared lightly the top of the tortilla with BBQ eel sauce, and then you topped it with fresh cut Tuna (sushi grade) and a layer of salmon gravalax. I just happened to have extra salmon today but you can definitely use only Tuna for this recipe. 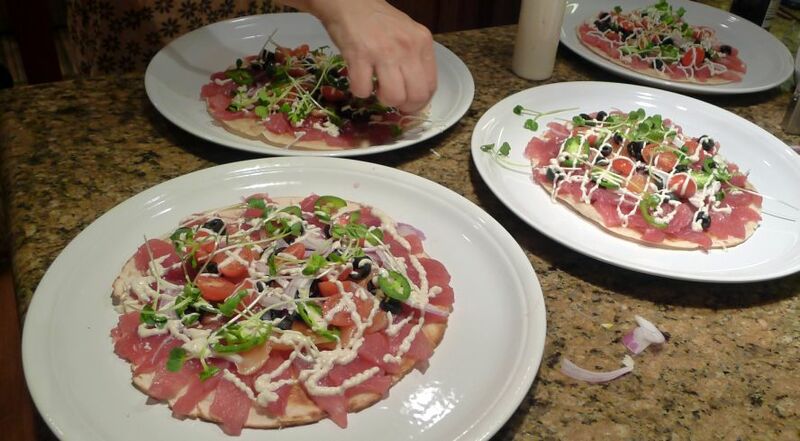 Next, add some colorful vegetables: cherry tomato, daikon sprout, thinly sliced red onion, jalapenos, and olives and then drizzle the whole pizza with anchovy aioli! Simply delicious and also so appetizing to look at! 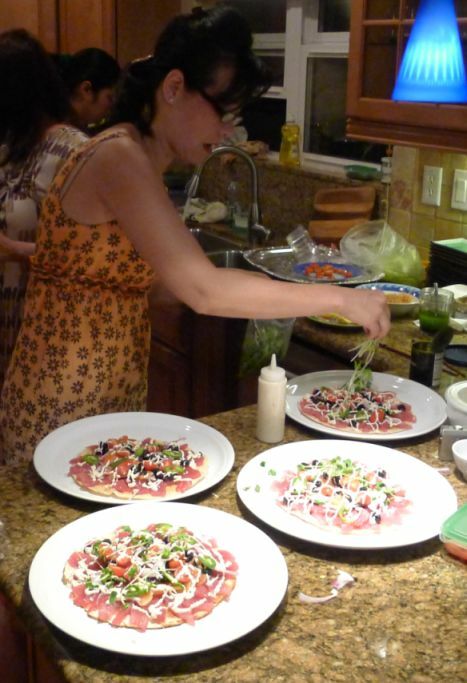 I served this dish at my Japanese theme dinner and it was a hit! Everyone love this dish and it was voted best dish of the evening. 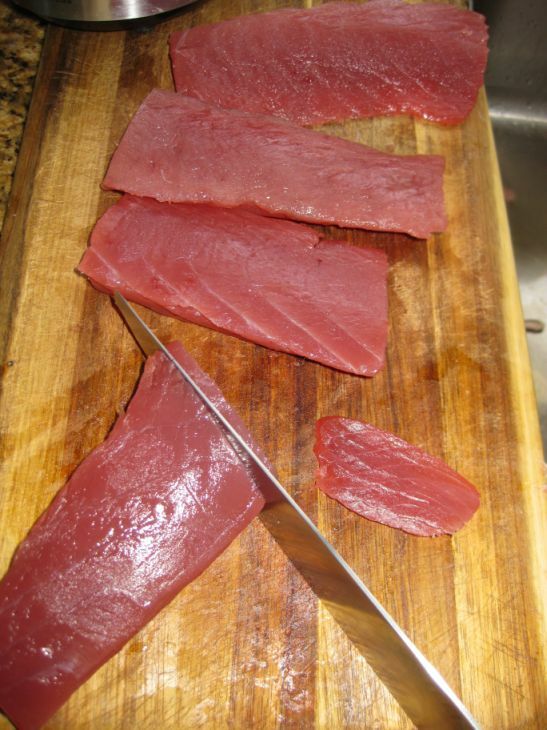 slice your tuna into thin slices and keep them refrigerate until ready to serve. Prepare the mayonnaise. In a bowl, combine the egg yolks, vinegar, lemon juice, anchovy paste and soy sauce. Blend well. 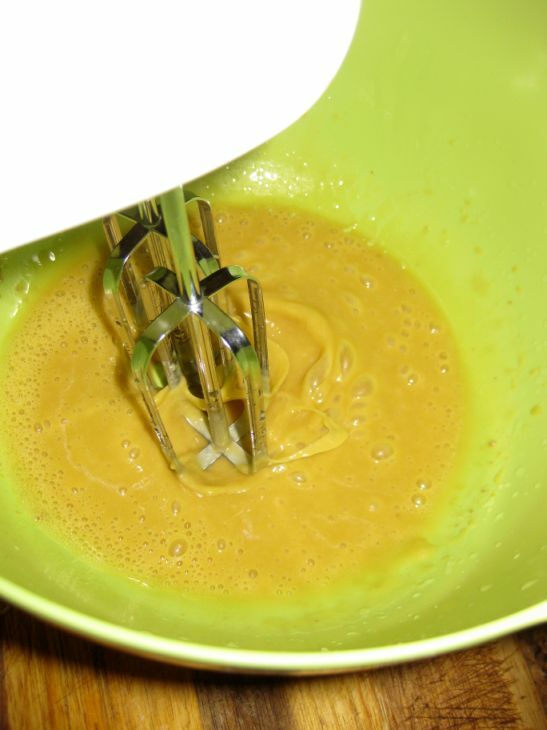 slowly add the oil and keep beating until the mayonnaise is emulsified and thick. Pour the mayonnaise in a squeeze bottle and refrigerate until ready to use. Heat an oiled pan - medium heat and put the 1st tortilla in the pan and let it brown a bit. Turn the other side and let it brown. The tortilla should be crispy. Brush the BBQ eel sauce on top of the tortilla. 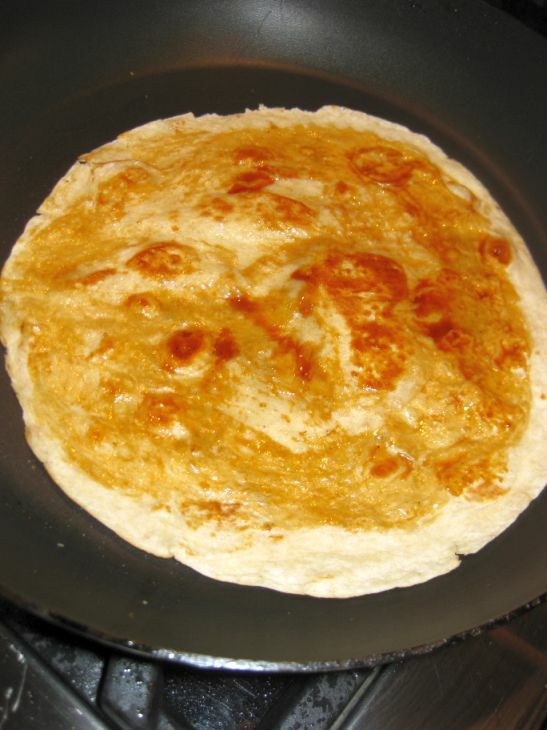 Remove the tortilla and put it on a plate. 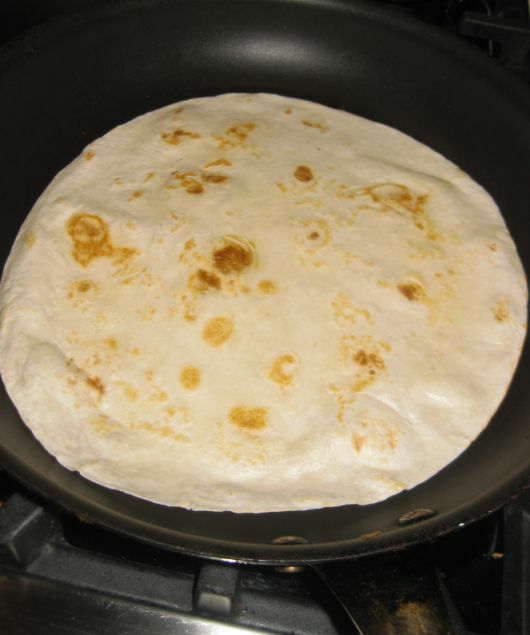 Continue to cook the remaining 3 tortillas. 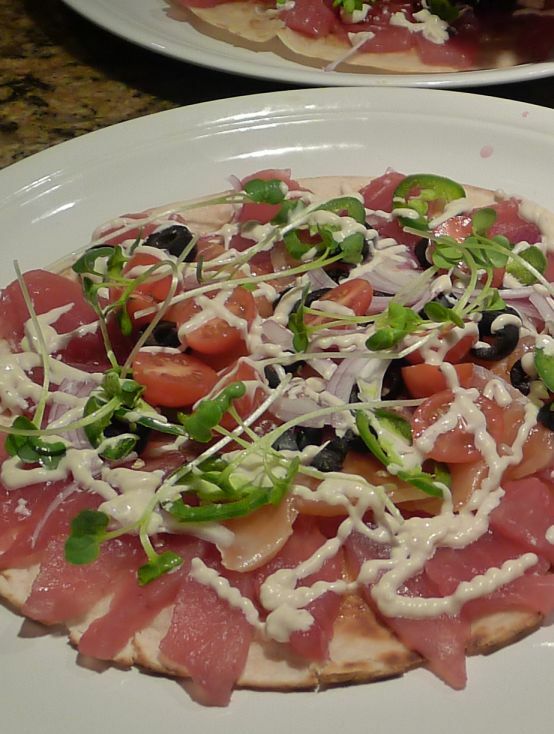 Spread the Tuna slices and salmon gravalax on each pizza. Add the red onion, cherry tomato, jalapenos, and olive. Squirt the anchovy aioli on top of the pizza and add some daikon sprout on top.